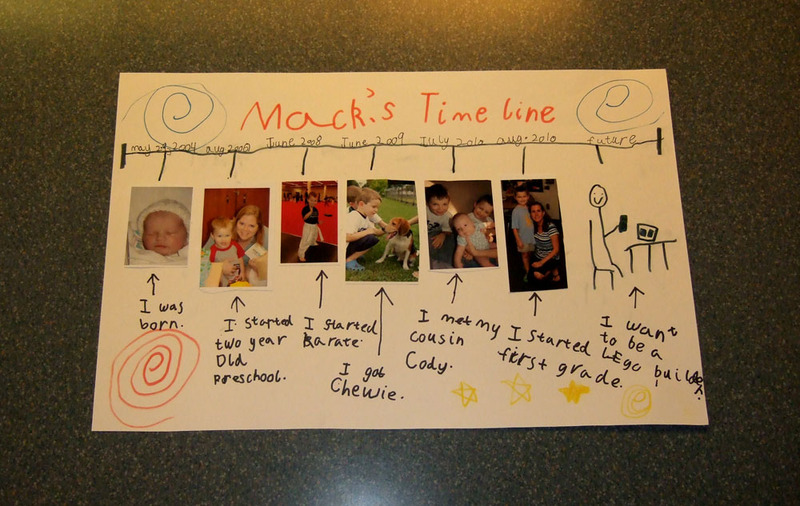 So Mack, my six year old, came home about a week ago and announced that he had to make a timeline of his life. He didn’t know any details. He didn’t have a written assignment telling us what to do. But he really wanted to get started right away. I told him we couldn’t start until I saw the assignment. The next day he came home with the assignment, stating that we had to do it right away! I read it, and saw that it was due Nov. 19. I told him we didn’t have time right then but we would work on it soon. So the next day Cal, my nine year old, mentioned that report cards were coming home the next day. Mack freaked out. He said we had to do the timeline immediately! It was going to be on his report card! I had to reassure him that was not the case. It wasn’t due until the 19th, after report cards were coming home. He was very worried and upset. We were only able to work on it a little over the weekend because Chad, the husband, was working from home all weekend and monopolizing the computer we needed (the one that stores all our old photos). Finally we were able to finish it today. He is happy and relieved and so am I (and it’s still not due until Friday) 🙂 I am grateful Mack’s timeline is finished. This entry was posted on November 15, 2010 by Caroline Calcote. It was filed under Uncategorized . Thank you for posting and adding MY picture to the timeline….I look MUCH better than I did at Bunco!! Thank you for letting Mack do the work and not making it a Mommy showboat! I hope it was fun for him. I can’t wait until the kids present them to the class.